Mapping Neighborhood Change — Willow Lung-Amam, Ph.D.
Story Map for Mount Pleasant Neighborhood in Washington, DC. I am interested in community mapping as a tool to help communities explore opportunities for asset-based community development, and engage in planning for change, particularly in neighborhoods threatened by gentrification and displacement. In recent years, Washington DC has served as a classic case study for what some call the back-to-the-city movement, or what Alan Ehrenhalt called “The Great Inversion” in American cities. Demographic trends show the city’s unprecedented popularity among young, largely white, middle-class professionals. Historically, however, Washington, DC was popularly known as the “Chocolate City.” Throughout most of the twentieth century, it was one of the few U.S. cities that not only had an African-American majority, but a thriving black middle-class who held long-standing political power. 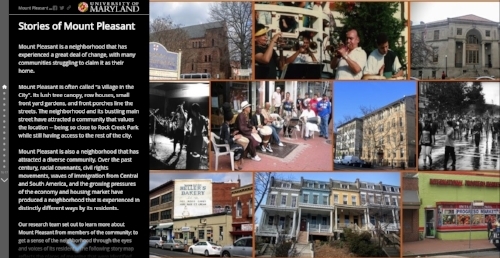 This research provides investigates what the loss of the “Chocolate City” means to diverse, long-term residents of the District. How do they view the changing demographics of the city and what do they believe they stand to benefit or lose from its transformation? The project documents the city’s transformation and gives voice to long-term residents’ memories and attachments to the city, its legacy, and their feelings and experiences of change by putting their stories on a map. In my class “Story Mapping Neighborhood Change in Washington, DC,” students collected and mapped long-term residents’ perspectives on change in five gentrified or gentrifying DC neighborhoods and layered residents’ stories with other contemporary and historical data about Washington, DC neighborhood. The full collection of maps and student work can be found here.